Could the eruption of the super volcano in present day Siberia have been the cause of a mass extinction 252 million years ago? From the boundless deep. Credit: Martin Mergili (distributed via imaggeo.egu.eu). Geotalk is a regular feature highlighting early career researchers and their work. 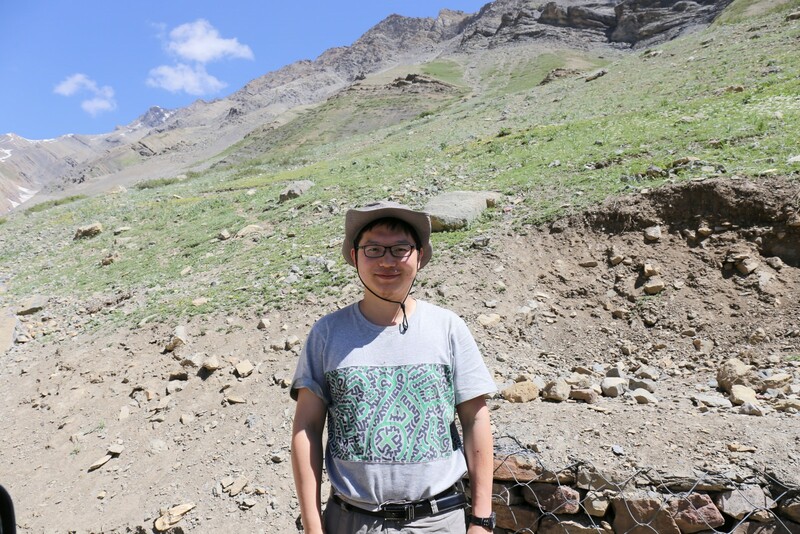 Following the EGU General Assembly, we spoke to Yadong Sun, the winner of a 2017 Arne Richter Award for Outstanding Early Career Scientists, about his work on understanding mass-extinctions. Using a unique combination of sedimentological, palaeontological and geochemical techniques Yadong was able to identify some of the causes of the end-Permian mass extinction, which saw the most catastrophic diversity loss of the Phanerozoic. Thank you for talking to us today! Could you introduce yourself and tell us a little more about your career path so far? Many thanks for inviting me here. I am currently working at the GeoZentrum Nordbayern, University of Erlangen-Nuremberg as a post-doc researcher. I grew up in a small coastal town called Haiyang, east to the major city Tsingtao in North China. I moved to central China for university and majored in Geology at the China University of Geosciences (Wuhan) in 2004-2008. This was followed by an exciting, 5 years split-site PhD program in which I spent two and a half years in China for field work and palaeontological training; half a year at Erlangen Germany for stable isotope and geochemical studies and the final 2 years at the University of Leeds, UK for training in sedimentology. After my PhD, I successfully applied a fellowship from the Alexander von Humboldt Foundation and become an honourable Humboldtian. In late 2015, two years after my PhD, I had 31 peer-reviewed papers including two in Science but was not fully prepared for the job market. It was already near the end of my fellowship. I only applied for one job—the O.K. Earl postdoc fellowship at the California Institute of Technology, US, but I didn’t get it. Completely unprepared for the situation, I was unemployed for about half a year. I considered this the first setback in my early career. It taught me a valuable lesson; since I applied various research funding and fellowships and have never failed. In early 2016, I was offered a postdoc position in a big project from the German Science Foundation (DFG forschergruppe) at Erlangen. I am very happy to be involved in the project and work again with many German and European colleagues. Meet Yadong, pictured on fieldwork in the Himalayas. Credit: Yadong Sun. During EGU 2017, you received an Arne Richter Award for Outstanding Early Career Scientists for your work understanding the end-Permian mass extinction. Could you tell us a little bit more about this period during Earth’s history? The end-Permian mass extinction, which happened 252 million years ago, is the most devastating crisis seen in the Phanerozoic (the period of time during which there has seen life on Earth). However, the ultimate killing (or triggering) mechanism of this mass extinction is not fully understood and has been intensely debated for years. Many fossil groups, in the ocean and on land were completely wiped out. The end-Permian mass extinction had profound influence on the evolution of life on Earth; such was the scale of the dying at this time. Extinction losses appear non-selective; virtually no groups escaped unscathed. In the oceans some of the most abundant organisms such as the brachiopods (two-shelled organisms), radiolaria and foraminifera were almost (but not quite) eliminated whilst the rugose corals, tabulate corals, goniatites and trilobites were forever lost. On land, the dominant herbivorous animals, the pareiasaurs, together with the gorgonopsids, the top predators, were lost. They lived in a world in which the dominant trees were the seed-bearing gymnosperms (e.g. glossopterids, gigantopterids, cordaites). All these groups, together with many other animals, including diverse insect groups, failed to survive the extinction. After the mass extinction, the Early Triassic world was a time of extraordinary low diversity with the same monotonous communities found everywhere. For example, there is a 5 million year gap during which corals are not found in the rock record. On land this included assemblages dominated by a shrub-like tree fern called Dicroidium, whilst the dominant animal was Lystrosaurus a pig-sized herbivore, belonging to a group called the dicynodonts. In the world’s oceans, in the immediate aftermath of the extinction, it was the mollusks which occurred in the greatest numbers; a bivalve called Claraia was prolifically abundant just about everywhere. It took an unusually long time (around 4-5 million years) for the biosphere to start recovering from the end-Permian mass extinction. This is much longer than after other mass extinctions and has lead scientists to speculate that the harsh conditions, responsible for the extinction in the first place, may have persisted for long afterwards. At the same time, ocean chemistry was probably very different to modern day Earth. The oxygen levels in seawater were very low. Despite the debate, what do scientists know about the causes of the end-Permian extinction? The causes of the end-Permian mass extinction are, as a matter of fact, not perfectly understood. There are many different hypotheses. The key is to test the different hypotheses. At the moment, we know with quite some certainty that anoxia (no free oxygen in seawater) and high temperatures both likely contributed to the end-Permian mass extinction. Around the time of the extinction, there was massive volcanic activity in present day Siberia, known as the Siberian Traps. The lavas they left behind are known as the Siberian flood basalts. The eruption of the super volcano triggered global warming, voluminous volcanic CO2 inject to the atmosphere could lead to ocean acidification. This is because CO2 reacts with water and becomes carbonic acid (CO2 + H2O ↔ H2CO3). This is a very new and popular hypothesis to explain the mass extinction. However, I myself am not fully convinced by the ocean acidification theory for the end-Permian mass extinction because there is a lot of evidence for carbonate over-saturated conditions at this time too. Carbonate saturated conditions mean that seawater contains very high concentrations of species such as CO32- and HCO3–. They easily combine with Ca2+ and precipice as limestone and calcite cements. High concentrations CO32- and HCO3– have a buffering effect which inhibit the reaction forming carbonic acid. Therefore, it is not really possible to have ocean acidification and carbonate over-saturation at the same time. More detailed studies are needed to investigate this paradox. In the past, some scientists proposed a sudden cooling or bolide impact as potential causes for the extinction, but these theories are no longer popular because of a lack of evidence. In your presentation at EGU 2017 you spoke about how the extinction was accompanied by a rapid temperature rise, from 25 °C to 32 °C. How were you able to establish that such a significant temperature rise occurred? I use oxygen isotope thermometry from conodonts: an extinct eel-like creature. Oxygen has two isotopes—18O and 16O. The ratio of the two isotopes in an animal is proportional to temperature from the oxygen isotope ratio of the water they ingest. Reconstruction of temperatures for the end-Permian mass extinction is not easy since most shelly fossils died out. Those preserved are often subject to burial changes and therefore no longer preserve the original environmental information. On the other hand, conodonts survived the end-Permian mass-extinction and are ideal for oxygen isotope analyses. They are very tiny (typically ~300 micro meter long) and consist of biogenic apatite. Apatite has 4 very robust P-O chemical bonds and very difficult to be altered after burial. Therefore, measuring oxygen isotope ratio of conodonts could help solved the problem. However, because conodonts are so small and rare in rocks, I had to collect 2 tons of carbonate rocks dissolve the rock in acetic acid and pick the conodonts one by one under a binocular microscope, to get a big enough sample! It was a lot of work and required a lot of patience. A Triassic conodont from south China. Credit: Yadong Sun. That certainly sounds like painstaking work! Once the tedious task was completed, how were you able to link the temperature records you deciphered from the conodonts with the mass extinction? All living creatures have a thermal threshold, also called thermal tolerance – the temperature range which they are able to tolerate to survive. It varies significantly amongst different groups. Most animals, on land or in the oceans, cannot live in environments that are consistently hotter than 47 °C. However, certain groups of desert ants and scorpions have developed special mechanisms and can survive 53 °C for a very brief time. Another example is the elevated seawater temperatures which contribute to high death rates of corals. High temperatures supress photosynthesis. In most C3 plants, at temperatures above 35°C, photorespiration exceeds photosynthesis, wasting the energy generated by the plants. in most C3 plants. Under such circumstances, C3 plants will stop growing and probably die shortly after. 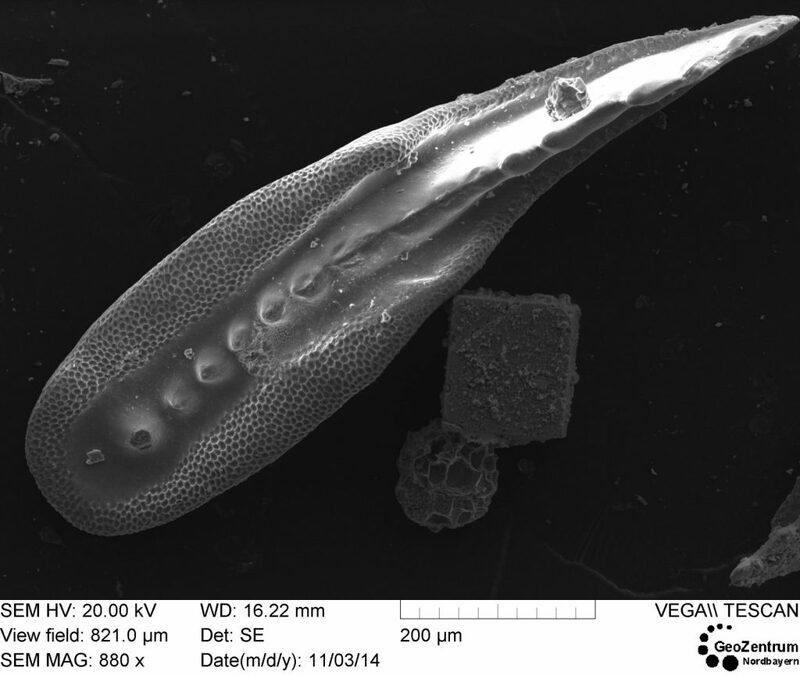 Maximum growth rates of single-celled algae in the ocean are normally achieved below 40°C. A significant rise in seawater temperatures has many negative effects. One of them is that the amount of oxygen dissolved in seawater decreases as temperature rises, while animals use up more energy to perform even the simplest tasks. . This is one reason for which most marine groups prefer environments < 35°C. These observations tie mass extinctions with temperature increase. For our study, once the oxygen isotope ratios of conodonts are measured, we can use it in an equation to calculate the absolute temperature of the seawater at the time. The results show significantly higher ocean temperatures than today. We know the equation explains the relationship accurately because it was established in aquariums where scientists raise fishes in controlled temperatures. As temperatures are known, they measure the oxygen isotope of the water and fish teeth and established the oxygen isotope—temperature equation. What do your findings mean for the current understanding of the causes of the mass-extinction? This is an excellent question. There are quite some studies which postulate global warming as a potential killing mechanism for the end-Permian mass extinction. 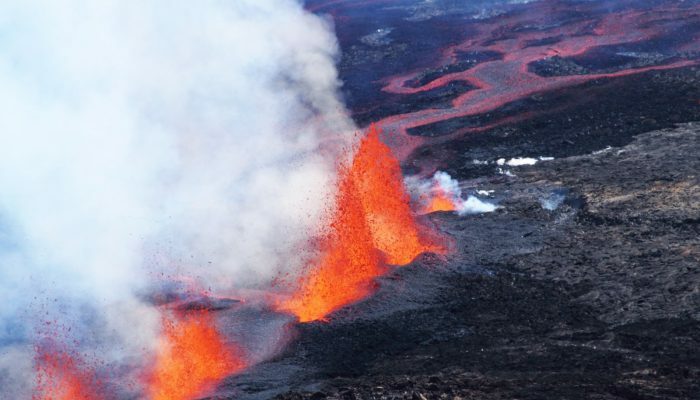 There is a link between the timing of the massive eruptions of the Siberia Large Igneous Province and the end-Permian mass extinction, which has led scientists to propose different warming scenarios. They are all correct, but they are not able to show direct evidence for their hypotheses or quantify the temperature change. Our data show the worst-case scenario in terms of temperature rise and the mass mortality of species. This does not necessarily imply high temperatures killed everything because many adverse environmental conditions could trigger synergetic effects (for example low oxygen levels). Our study set an example for comparison. Our results mean that rapid warming, such as what we are encountering at present, is truly worrying. Yadong, thank you for speaking to me about your reasearch. As an award winner with an impressive career so far, what advice do you have for early career scientists? Europe is probably the best place in the world for young scientists. It provides considerable fair funding opportunities and many possibilities to work with other scientists in the EU. However, it is undeniable that fixed positions in academia are rare and highly competitive. It is always the best to go to meetings/conferences at least once a year to showcase your research, meet colleagues and seek collaboration opportunities. Research projects nowadays are much more complex. Many tasks cannot be done by one person or one team. The success of a young scientist cannot be achieved without the support of senior scientists as well as the community. Also don’t be shy to contact people and always be prepared for the job market. In the post-doc stage, if your project is very challenging, the best strategy is to work on some small projects on the side and keep publishing.